Boxcutters, Jigger, Muddler, Shaker Classic/Boston, Citrus Juicer, Strainer, Tablespoons, Rocks Glass. Muddle Lemon Juice, Maple Syrup, and Cherries in a cocktail Shaker. Add Whiskey, Lillet Rouge, Egg White, Bitters, and Ice; shake vigorously and strain into an old Fashioned Glass filled with Ice. 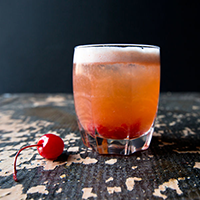 Top with Seltzer and garnish with a Cherry.